Nonsequitur | Mark Hosler + Noel Brass, Jr.
Mark Hosler + Noel Brass, Jr.
Negativland founding member Mark Hosler takes a break from his band duties to perform solo for the first time ever in his 33 years of making music. Using various homemade one­-of­-a­-kind electronic noise-making devices (including two of Negativland’s original “Boopers”), he creates an engaging and musical soundscape performance. Designed to create a non­linear dynamic “living” system of sound to interact with, it ends up being a performance dynamic where the musician is a fellow collaborator with the devices, encouraged to converse instead of merely transmit. 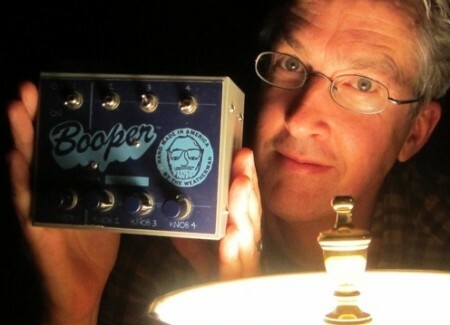 The Boopers used in this show go back to 1975, when Negativland co-founder David Wills added multiple transistors to a simple FM radio receiver, sending its output back into its input. Various knobs control the amount of signal through the transistors, but the sound that emerges remains wildly variable. Using multiple Boopers (all based on Wills’s original design) and other homemade electronics, Hosler manipulates and augments the raw sound sources into a choral rainforest of pure electronic ear candy, erasing any easy distinction between the machine and the human. Opening is electronic keyboardist Noel Brass, Jr. The founder of Seattle psych-soul trio Afrocop steps out to do his solo thing, crafting his signature improvisational ambient soundscapes inspired by film noir, Gospel, jazz, and psychedelia.